In a non-stick pan, stir together the buckwheat, coconut oil, cacao powder, cinnamon, and salt until evenly coated. Toast on medium low heat stirring constantly for 6-8 minutes until it is starting to brown and looks dry. You will also start to smell the toasty scent when it’s done too. Remove from heat and transfer to a dish to cool. In a food processor, process the dates until broken down into a sticky paste with no large chunks remaining. Add the cacao powder, coconut flour, coconut cream, salt, and vanilla. Process to form a sticky dough. 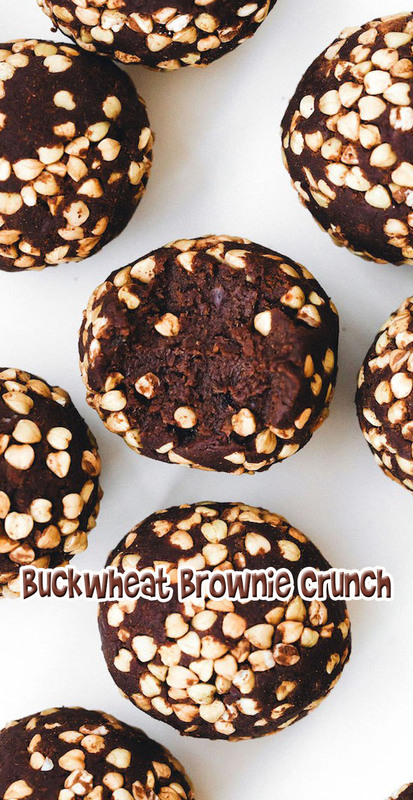 Scoop out one tablespoon at a time, roll into a ball, and roll to coat in the toasted buckwheat. Refrigerate for a couple of hours until firm (and they just taste better cold in my opinion). Enjoy straight from the fridge. Keep the leftovers in the fridge in an airtight container for up to a week.